NORWELL, MA Issued June 11, 2018… The Academy of the Company Theatre’s (A.C.T.) Studio One program has opened registration for its 2018 summer arts programs. Classes run from the week of July 23 through August 16. All programs are held at The Company Theatre Center for Performing Arts, 30 Accord Park Drive, Norwell. Founded in 2013 as an extension of The Academy of The Company Theatre, A.C.T.’s Studio One offers classes that will help anyone with an interest in the performing arts refine their skills, whether they’re a beginning student, a veteran of the stage, or somewhere in between. As part of a working theatre, A.C.T.’s Studio One offers students opportunities to perform and be a part of a vibrant and active theatre scene. The mission of A.C.T.’s Studio One to offer classes that foster self-expression and ability in the performing arts in a creative and safe environment through progressive training to children, teens and adults. An essential part of dance training is developing a student’s flexibility and strength. 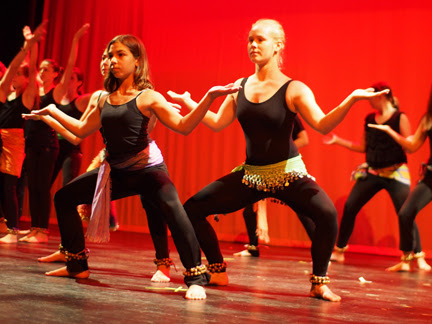 Dance Conditioning and Flexibility (ages 8 to 18) makes technique more impressive, and helps young dancers avoid injury on their dance journey. Class time includes exercises from barre classes, yoga and Pilates to increase both flexibility and strength in a healthy, safe way. Mondays, 4 pm to 6 pm. In Acting for Dancers (ages 8 to 12) dancers engage in acting exercises to improve expression in performances and make better storytellers through movement. The class focuses on conveying emotion through movement and character by exploring physicality, body language and facial expression. Tuesdays, 10 am to 11:30 am. Teen Cabaret (ages 13 to 19) rehearses and refines student song performances from classic and modern musical theatre for a cabaret night on The Company Theatre stage! Emphasis is placed on capturing character and setting without the use of sets and costumes. Students arrive at the first class with song choices selected. Wednesdays, 4 pm to 6 pm. A fun workshop-style class, Children’s Acting and Improv (ages 8 to 13) offers an introduction to both improvisational theatre and acting. Students play theatre games as warmups, then learn how to create memorable characters, build compelling scenes, use physicality, work well as part of an ensemble, read from a script, and have fun! Thursdays, 3 to 5 pm. Serious acting student class Teen Acting Intensive and Repertoire (ages 14 to 19) meets twice a week for two hours, with class time split between honing advanced acting techniques, studying must-know repertoire, and rehearsing a play for an end of workshop performance. Previous acting experience is required for all enrolled students. Tuesdays and Thursdays, 6 to 8 pm. For complete A.C.T.’s Studio One program descriptions, schedules, pricing or registration information, visit www.companytheatre.com/academy/studio-one/. Enrollment is limited, early registration is recommended. All programs require a one-time $25 registration fee per family. Families with multiple enrolled students receive 10% discount off each class after the first student. For the latest information on programs, call Studio One at 339-469-1776. For information on performances and special events, visit www.companytheatre.com, call the box office at 781-871-2787, or follow The Company Theatre Center for Performing Arts on Facebook, Twitter and Instagram. Established in 1979, the award-winning Company Theatre is the South Shore region’s year-round professional theatre. The Company Theatre is also home to The Academy of the Company Theatre, the theatre’s popular performing arts academy, and an annual concert and special events series. For the latest information on The Company Theatre’s programs and performances, visit companytheatre.com, call the box office at 781-871-2787, or follow The Company Theatre Center for the Performing Arts on Facebook, Twitter, Pinterest or Instagram. Caption: The Company Theatre’s summer programs serve all ages and interests of students in the performing arts. The Company Theatre is a nonprofit, tax-exempt organization under section 501(c)(3) of the US Internal Revenue Code.